Jojoba oil is unique. It is a liquid wax, is very stable with a long shelf life.This plant-derived product acts in an almost identical way to the skin’s sebum – to control the moisture levels in the skin.Jojoba oil is a unique natural moisturizer for face and body for the whole family. Gentle enough for baby’s skin.Try jojoba oil for massage treatments - personal healthcare professionals prefer it. Ideal bathroom size to moisturises your whole body any or every day. 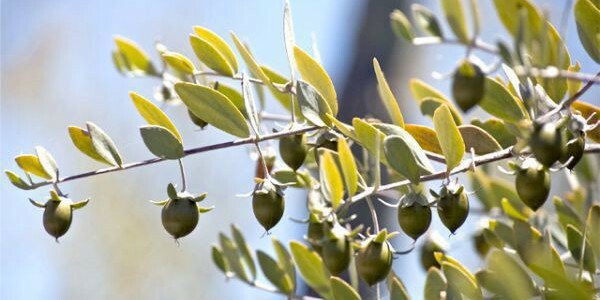 Jojocare supplies high quality but affordable Australian-grown golden jojoba oil to Australian clients. It is the preferred product of healthcare professionals in the massage industry. Jojoba oil is a key ingredient worldwide in many high quality cosmetics, hair and skin care products. One word describes golden jojoba…Luxurious! Why pay more for soothing and moisturising your skin. Jojoba oil is the natural way to feed your skin and it has no additives.